(left to right) YSD Chief Executive Officer Puan Hajjah Yatela Zainal Abidin, YSD Governing Council Member Caroline Russell, University of Nottingham Malaysia Campus (UNMC) Vice-Provost (Research and Knowledge Exchange) Claire O’Malley and UNMC Associate Professor Dr Ahimsa Campos-Arceiz pose with Department of Wildlife and National Parks of Peninsular Malaysia (PERHILITAN) Enforcement Division Director Hasnan Yusop at the event to announce YSD’s extension of support to the MEME project. 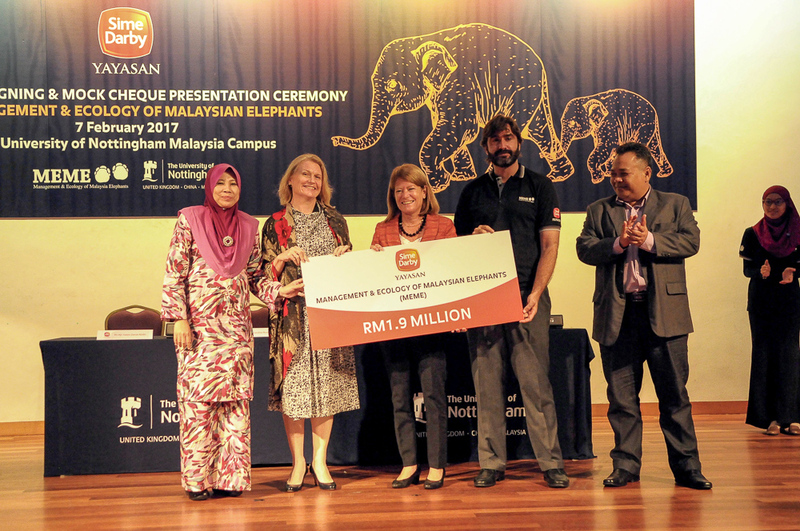 KUALA LUMPUR, 7 February 2017 – In an effort to save the gentle giants of Malaysia, Yayasan Sime Darby (YSD) is extending support for the Management and Ecology of Malaysian Elephants (MEME) project with a RM1.9 million commitment for another three years from Jan 2017 until Dec 2019. This year marks YSD’s sixth year of support for the MEME project to preserve Asian elephants in Malaysia. YSD first sponsored the MEME project in January 2012, committing RM3.36 million until December 2016. The project is helmed by University of Nottingham Malaysia Campus (UNMC) School of Environmental and Geographical Sciences Associate Professor Dr Ahimsa Campos-Arceiz with cooperation from the Department of Wildlife and National Parks of Peninsular Malaysia (PERHILITAN). YSD Governing Council Member Caroline Christine Russell said that as of September 2016, the MEME project has recorded significant findings that illuminate the behaviour and ecology of the Asian elephant in forested areas of Malaysia, as well as their interactions with people. “The findings of the MEME project include the revelation that elephants have lost nearly 70% of their roaming territory in human-dominated landscapes in Malaysia over the past 35 years; an alarming rate. “Unfortunately, we still do not know well their distribution in non-human dominated landscapes, such as forest reserves and protected areas. “We need urgent solutions and initiatives to stop the decrease of wildlife populations in Malaysia, including elephants, before it is too late. We also need better baseline data to monitor the status of their population in the long term,” she said. Dr Campos-Arceiz said the extended sponsorship will assist MEME to fund their research team, field equipment as well as field operations. “Since 2011, MEME is generating a large amount of novel information on the ecology and conservation of elephants in Peninsular Malaysia, including information on the distribution of elephants in human-dominated landscapes, elephant diet and movements in fragmented landscapes, their ecological importance for the maintenance of forest ecosystems, and the effectiveness of different strategies for the mitigation of human-elephant conflicts. “This extended sponsorship is very important for MEME because it will allow us to complete our ongoing research as well as use this newly generated information to advise policy-makers and create public awareness for the conservation of these magnificent animals in Malaysia,” he said. One of MEME’s objectives is capacity building and training the next generation of elephant researchers and conservationists in Malaysia, which has been made possible through YSD’s funding. In this regard, UNMC student Dr Ee Phin Wong recently obtained her PhD for the non-invasive study of stress in wild elephant. Dr Wong is now Assistant Professor at the University of Nottingham Malaysia Campus. Two other students – Hii Ning and Ange Tan – have received their Masters in Research for the study of elephant social behaviour and distribution, respectively. By the end of 2019, it is expected that MEME will have trained five PhD and three Master by Research Malaysian students. The team has also played an important role in the drafting of the National Conservation and Action Plan (NECAP), which was launched in 2013, and is one of the key members of MyGajah, the steering committee that oversees NECAP’s implementation. Under its Environment pillar, to date, YSD has committed RM130 million towards the protection of high conservation value ecosystems, vulnerable and endangered species as well as initiatives promoting the preservation of the environment and biodiversity.